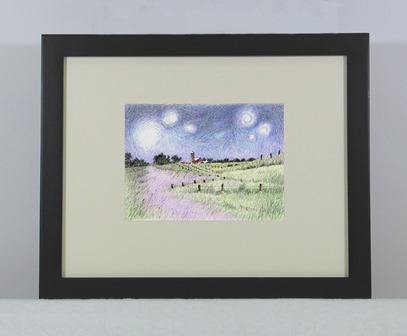 Original Ink Pen and Colored Pencil Drawing by Artist Suzanne Poursine Massion - "Starry Night Pasture"
Includes tax, shipping and insurance within the continental USA. Also available for pickup at my home/studio in Hampshire, IL. I want your new artwork to add to the beauty of the space it will occupy. For this reason, buy this drawing with the confidence that you can return it in 7 days. This is the perfect gift for a friend or special occasion. 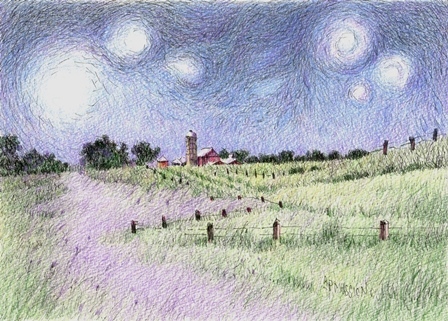 Purchase "Starry Night Pasture" for that space in your home or office that cries out for a small eye catching peice of original art. Each drawing in this collection is unique. I do not repeat myself. "Starry starry night, paint your palette blue and gray, look out on a summer's day.... Shadows on the hills, sketch the trees and the daffodils...."
A little bit of Don McLean's beautiful song, "Vincent" and some inspiration from Mr. Van Gogh himself. This drawing is matted and backed but unframed. 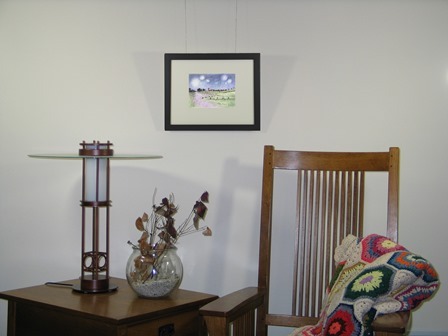 The matted size is 8"H x 10"L.
All images of original or reproduction artwork by Suzanne Poursine Massion are protected under United States Copyright Law. All rights are reserved by the artist.